As we settle more and more into our routine, the girls are more than happy to try and help me with "Tot School" and Kaleb (because really any excuse to play is good! Kaleb has always been very laid back in comparison to our other kiddos, but this week we are seeing more of his little personality shining through. 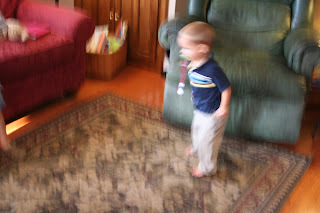 He's had more alone time with me this week and he has been hysterical! He's trying to talk more, "singing" to himself, and just cracking us up - doing most anything to get a good laugh from us. 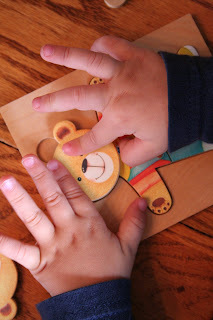 We have a little bear puzzle that allows you to change the bears shirt, pants and face. Each face pictures a different emotion: sad, happy, mad, etc... Kaleb had fun fitting the pieces into their form. 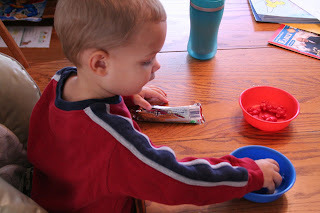 I pulled out some counting bears that I recently bought and also some bowls of the same color to have Kaleb try to sort the bears by color - this is where I was really suprised. He did GREAT!! When he would put a bear in the wrong bowl, he would stop and pick it out and drop it in the right bowl. We started out using only 2 colors, but eventually did all four colors. I did videotape it too (and he did it for the most part then), but he was a little over doing it then, so you'll just have to trust me on it! 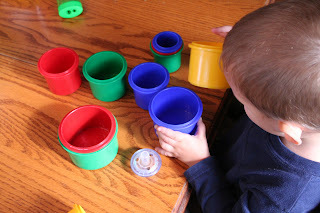 The stacking cups came out again, but this time Kaleb wanted to fit them all back into each other which he did wonderfully, pulling out the ones needed to sort them by size. 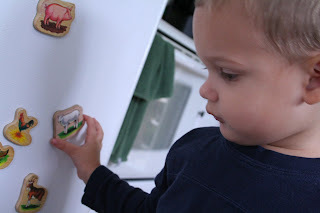 Some new animal magnets were also added to the fridge to play with. Kaleb didn't want to play the way I wanted to play, so we had fun pulling them off the fridge and putting them in a bag and counting them together instead. That's it for this week (at least the pictured part). Thanks for stopping by! looks like fun! i love my teddy bear counters we also have kangaroos! looks like you had a fun week!! I have been wanting to buy some counting bears...I just have not had a chance yet to get to a teacher supply store to get them. Looks like some great creative play & learning! You have cute little blessings and a nice family! Aren't we blessed to have them and be able to teach and love them daily! Hope you have another wonderful Tot School week!